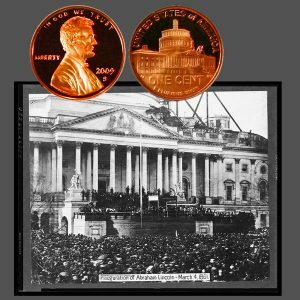 Today, the Lincoln Presidency One-Cent Coin remembers the inauguration ceremony of March 4, 1861. The Inauguration— March 4, 1861. The procession set out from the Executive Mansion. President Buchanan there entered the carriage, which, drawn by four horses, and preceded by the Marshal of the District, with his aids, on horseback, moved out of the grounds to the avenue. In front of Willard’s Hotel a halt was made. Mr. Lincoln walked out through the crowd, which civilly opened a lane to permit him to pass, and entered the carriage. The Chief Justice of the United States now came forward. His venerable appearance gave, to what might have been a mere matter of form, great dignity and impressed significance. The ceremony ended. Then those upon the platform rose and remained standing as the President and his party passed back into the building. The procession reformed in the same order as before, and returned, leaving at the White House as President of the United States the private citizen it had escorted from the hotel. Within an hour, another carriage, in which there was a single occupant, was driven down the avenue to the only railroad station then in Washington. It contained Ex- President Buchanan, returning as a private citizen to his Pennsylvania home. The Lincoln Presidency One-Cent Coin shows with an image of the inauguration on March 4, 1861.